Landscape is all of these–all the time–stirring–changing…and so I must write. And so it is, too, for Erik Chalmers, the protagonist in The 23 Club, himself strangely attracted to the mysterious Empty Quarter…despite the exhilarating life around his home in the Berner Oberland of the Swiss Alps. Only his obsession with landscape, to build captivating gardens, could drive him to this place, the Empty Quarter, a place historically incapable of supporting life! 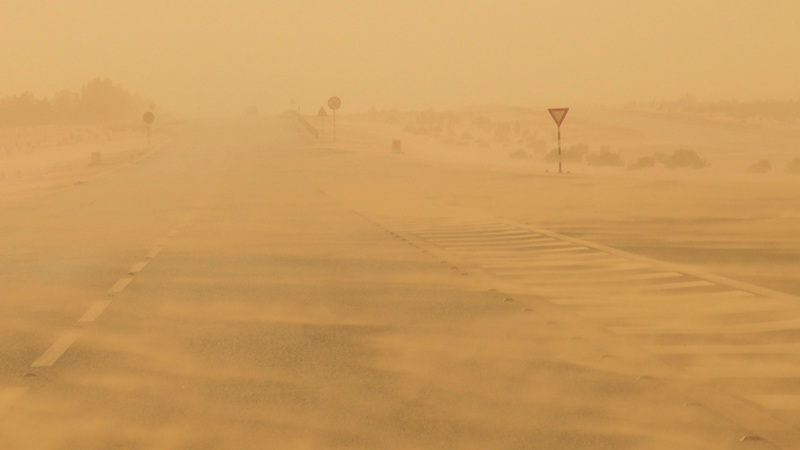 This is Erik Chalmers’ landscape journey into the Empty Quarter. 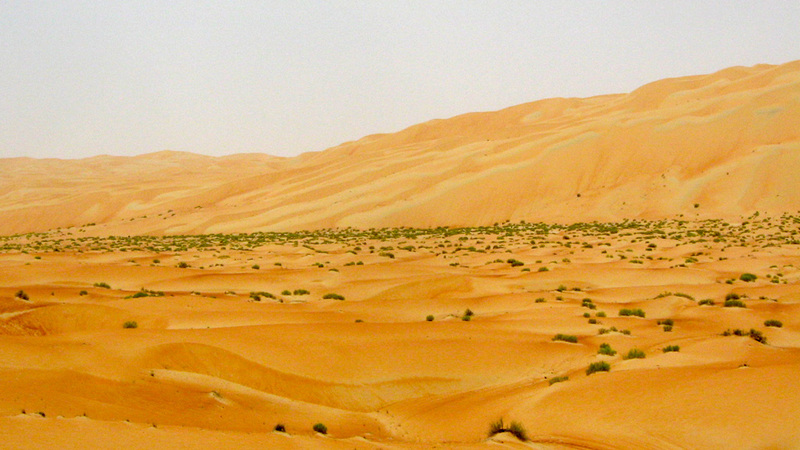 This is the Rub al Khali. With its own chiaroscuro, this beast turns obsession inside out. The 23 Club is a landscape story. It is fiction from fact. It is chiaroscuro. Erik Chalmers’ journey through geography…through history…at best, like the story itself…chiaroscuro…always a blur, always a hope–for clarity, for an inspirational result. It may be a passion trying to find fertile ground, before it takes root. But then as it takes root, a strange transition occurs–passion into obsession–the roots go wild, they travel hard and fast and far…the obsession grows…and then what? 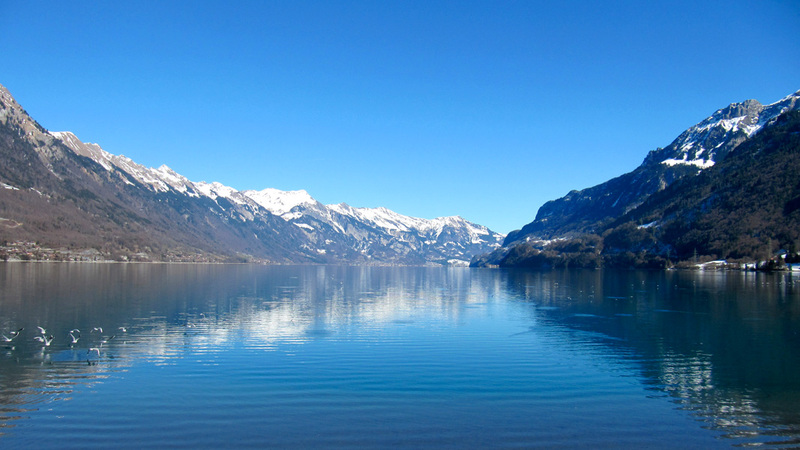 Berner Oberland: a humid, temperate, arable soil forest that I first experienced in real life in the 1960s, and it has been a landscape destination for me every decade since. Rub al Khali: an arid, tropical, topsoil free, sand desert that I first experienced as, if you will permit me, a mesmerizing augmented reality in David Lean’s ‘Lawrence of Arabia’. That was also in the 1960s in the London West End. It became a landscape mystery I have explored every decade since. Throughout my professional landscape architectural career, I have over and over, walked, drove, read, smelled, heard, felt–explored the above landscapes…they live inside me–they have taken root. They are growing. From these distinctive landscapes has emerged a landscape obsession, an infatuation that can only be satiated by giving life to landscape stories, fictional stories that derive from personal experience, stories that endeavor to explain those landscape experiences which are…beyond words. 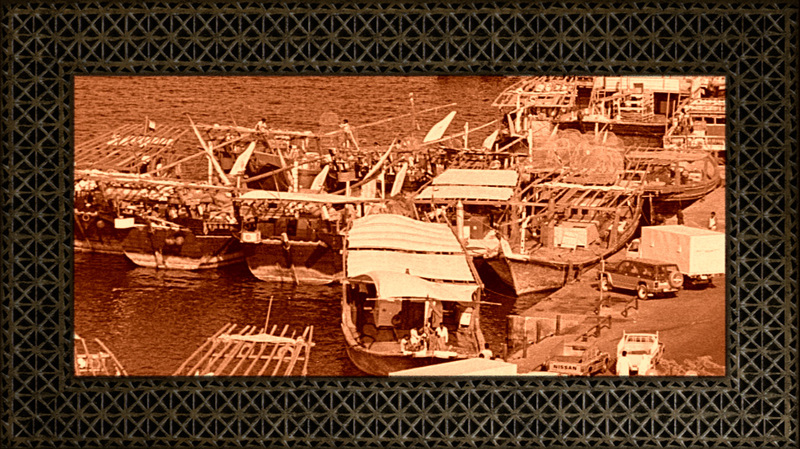 Dhows still ply the Arabian Peninsular waters today, albeit with diesel engines in their holds. 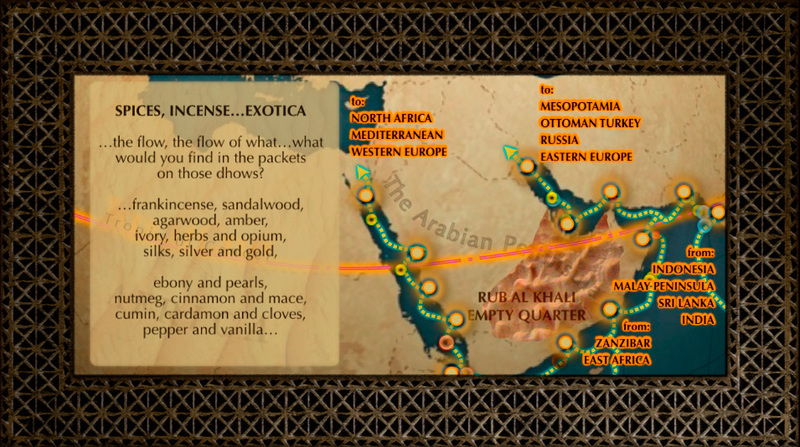 On the edges of the Rub al Khali, dhows have always carried information and goods along what we all have known as the ‘Spice Route’. For millennia, dhows traversed these barely habitable edges of the Arabian Peninsula and the Empty Quarter creating at the ports, point concentrations for massive flows–massive flows of information and exotic goods–which exotic goods you ask? Let your dreams be your guide. Dhows have always bounced port by port along the edges of the Empty Quarter. 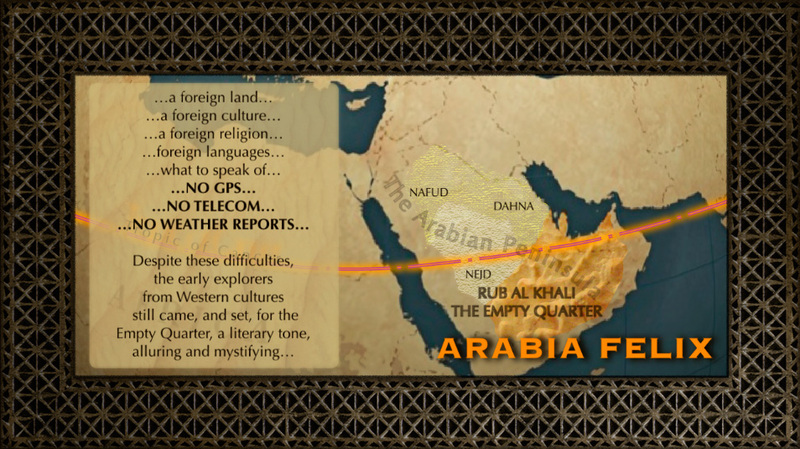 Little wonder why Westerners have been attracted inland from these ports…inland in the southern Arabian Peninsula to discover something richer than mirage–to explore what must be mysterious history, paths, journeys, routes–answers in the shifting sands of the Empty Quarter. Dedicated to Ibn Battuta–a Dubai mall. It consists of six courts, each of whose designs are inspired by some of the countries visited by the great Moroccan Berber explorer, Ibn Battuta. These courts are Egypt Court. India Court, China Court, Andalusia Court, Persia Court and Tunisia Court. The Ibn Battuta Mall is a large shopping mall on the Sheikh Zayed Road in Dubai close to Interchange 6 for Jebel Ali Village. Who is Ibn Battuta? …he was from the West…western North Africa. Today happens to be the 711th birthday of Ibn Battuta, whose importance to history hasn’t been unfairly overlooked, in contrast to some other people we could mention. Born to a Berber family in the city of Tangier (in modern Morocco) in 1304, Ibn Battuta is rightly famous for his incredible world travels and the book he dictated (called Al-Rihla, “The Journey”) about them. Think of him as the Muslim Marco Polo if you want (and coincidentally enough his travels began in 1325, the year after Marco Polo died in Venice), but in terms of distance traveled and places seen, Marco Polo (probably) had nothing on Ibn Battuta. Gertrude Bell was a pioneering and fascinating woman, very much ahead of her time. As Wikipedia tells us: Gertrude Margaret Lowthian Bell, CBE (14 July 1868 – 12 July 1926) was an English writer, traveller, political officer, administrator, archaeologist and spy who explored, mapped, and became highly influential to British imperial policy-making due to her skill and contacts, built up through extensive travels in Greater Syria, Mesopotamia, Asia Minor, and Arabia. Along with T. E. Lawrence, Bell helped establish the Hashemite dynasties in what is today Jordan as well as in Iraq. Four incredible deserts–Nafud, Dahna, Nejd and the Rub al Khali. No weather reports–no GPS–no communications? No way. Still felix? Our Western image of the Empty Quarter landscape, an image pieced together from the writings of our past, the holy books, the Greeks, the Romans, Marco Polo(1254-1324), Ibn Battuta(1304-1369), the ships docking in Genoa and Venice, the writings of Richard Francis Burton(1821-1890), Gertrude Bell(1868-1926), T.E. 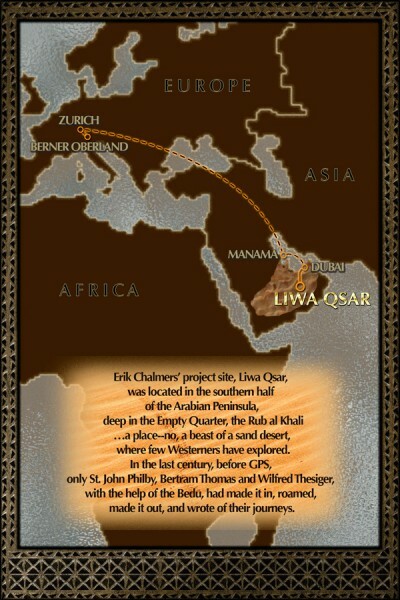 Lawrence(1888-1935), Wilfred Thesiger(1910-2003), and others, continues today–even with GPS, even with 24/7 online large pipe digital coms–to be a mystery…an unknown landscape…still beckoning…still threatening.